Campaign for the American Reader: What is Kelly Parsons reading? What is Kelly Parsons reading? 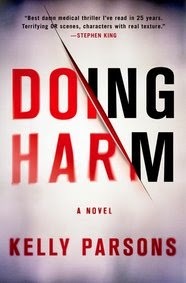 Featured at Writers Read: Kelly Parsons, author of Doing Harm. As a medical thriller author, some folks are surprised to learn that I rarely read them. There are many fine medical thrillers. But my tastes are eclectic, and for inspiration I draw regularly from a diversity of genres: contemporary fiction, literary fiction, thrillers, science fiction, fantasy and nonfiction.